Ten years ago this week... I was a senior in high school and the homecoming game was on Friday. Why does this matter... well I'm a Texas girl, even though I wasn't born here. Here in Texas we say everything is bigger. In many ways this is true. Especially when talking about mums. On average a mum can range in size from 18 inches long to 3 feet with ribbon. Bigger the better they say. When trying to explain the tradition of a mum to an outsider I often feel like I am speaking another language. I did some Google searching and figured surely I would be able to find an official history of the homecoming mum. Not so much; I found the history of the flower and the history of homecoming itself. But nothing that really explains how it got to be that people wore flowers to a football game. A lady in a flower shop had a son. The son had a girlfriend. The girl had no hopes of ever being Homecoming Queen, or even in the court. The mom wanted to the girl to feel special and be looked at in awe similar to the looks the Queen got. So a simple flower with a few ribbons for the girl to pin on her shirt was born. Now in Texas the story cant stop there!!! Fast forward a hundred years and the mum is a fashion statement on its own. If your mum isn't big... go home. If you are older than 5 and at a homecoming football game and you don't have one... your mom/dad/or boyfriend must not really love you. Being from California, my mom missed that memo and I never had a mum in school. Thinking back, since I dated a football player he really fumbled that one. So when Apryl was in school... that could not happen. So she had a mum 3 of the 4 years... each getting larger and more elaborate! Once upon a time mums were made with real flowers are now silk. That means they last forever! ::tehe:: The 3 large mums now hang on my sister's wall. I'll show you soon. But over the next few days I will show you I made mums myself. A few different ribbon styles, tips, websites to go to, videos to watch.... 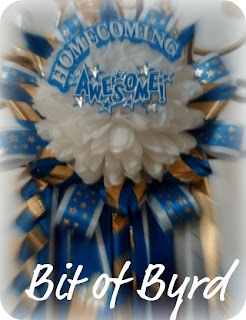 Your one stop shop on how to make a homecoming mum... Right here at Bit of Byrd!